During the 1950s, the State Department sent jazz musicians on international goodwill tours. As a uniquely American form of music, jazz could display the best of American culture with artists like Dizzy Gillespie, Dave Brubeck, Duke Ellington, and Louis Armstrong. 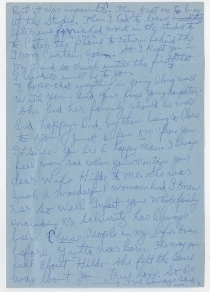 This letter, written to a German friend between his visits behind the Iron Curtain to East Berlin, East Germany, and Budapest, Hungary, reflects his busy schedule at the height of his popularity in 1965. LOUIS ARMSTRONG. 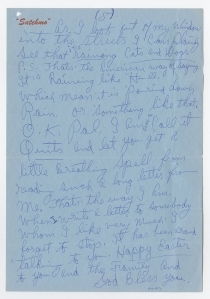 Autograph Letter Signed, to Erich Kauffmann, April 17, 1965, Corona, Queens, New York. 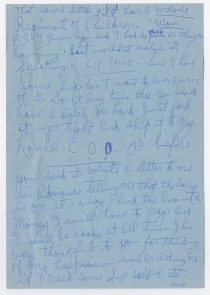 On “Satchmo” stationery. 6 pp. Here I am sitting in my home in Corona on Easter Sunday night. 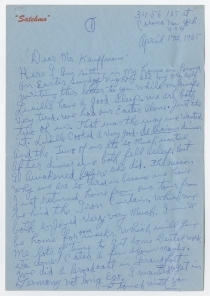 All by myself writing this letter to you while my wife Lucille have a good sleep. We are both very tired. We had our Easter alone. Just the two of us. That was the way we wanted it. Lucille cooked a very good, delicious dinner and the Two of us ate so munch until after dinner we both fell asleep. But I awakened before she did. The reason why we are so tired is because we have just returned home from our tour from behind the Iron Curtain, Which we both enjoyed very very much. I will be home for four weeks, which will give me lots of time to get some Dental work etc. done. Catch a few shows maybe. We did a Broadcast in Frankfort Germany not long ago. I wanted to get in touch with you <2> But it was impossible. They kept me so busy at the Studio. Then I had to leave immediately after we finished work in the studio to catch the plane to return behind the Iron Curtain again. So I kept you in my mind so much untill the first letter that I write will be to you. I hope that everything is going along well with you. And your fine young daughter she and her family should be well and happy. And by them being so close to you just a few KMs from you I am sure you are a happy man. I always feel very sad when you mention your dear wife Hilde to me. She was such a wonderful woman. And I knew her so well. In fact your whole family including Mr Schuritz has Always been Choice people in my life. Even before Yulta was Born. The way you feel about Hilde, she felt the same way about you. True love. So as I’ve always said <3> When two people loved each other like you & Hilde did you must feel contented Never worry Never grieve even if you should marry again. Stay happy. I preach those same words to Lucille Lots of times during our life together. I have so much happiness from the life she and I have already live together until I don’t want No Misery from which ever one should leave this Earth “LAST.” I think she gotten the Message, which means she understand. My regards to Yulta, Her Husband & their cute little Baby. Lucille sent her regards also. Just imagine how kids can grow so fast. The last time I saw Yulta she was a little girl. well that is life. We were all young once. HUH? Lucille’s niece who was very young when I was Lucille’s sweetheart some years ago of course and now <4> that same little girl has a whole Regiment of Children. “Wow.” P.S. I guess you and I had as much fun as they’re having, but we didn’t realize it. In the mid-1930s, Louis Armstrong was in Germany in the midst of a European tour with a split lip. He had recently met trombonist Franz Schüritz, who invented Ansatz Crème, a lip balm developed for horn players. Erich Kauffmann married Schüritz’s daughter Hildegard and managed the family’s business. In 1961, Armstrong only half-jokingly informed Kauffmann that “When and if you should stop making the salve, I shall quit playing the trumpet.” The Louis Armstrong House Museum in Queens, New York, has hundreds of tins of the salve that Armstrong accumulated. 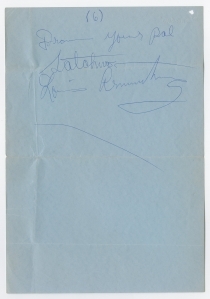 Armstrong and Kauffmann corresponded until at least 1970. Armstrong assembled a group he called the All Starts and toured France in 1948, Japan in 1954, Ghana in 1956, and Italy in 1959, all in support of U.S. interests. From 1961 to 1967, the U.S. State Department sponsored Armstrong and his All Stars in goodwill concerts around the world. In his European concert tours, where he became known as “Ambassador Satch,” his popularity among soldiers and civilians on both sides of the Berlin wall was legendary: “No boundary was closed to Louis,” said bassist Arvell Shaw. Audiences in East Berlin cheered within a few notes, demonstrating that they already knew the songs from venues like Radio Free Europe. Although outspoken against the attack on Selma marchers on Bloody Sunday weeks earlier, Armstrong refused to criticize the United States while in a communist country, even though East German reporters asked him many questions about American race relations. He did, however, play a song that had not been in his repertoire for more than a decade, “(What Did I Do to Be So) Black and Blue?” He played it slower than ever, turning the line “My only sin is my skin. What did I do to be so black and blue?” into a mournful lament over race. Armstrong and the All Stars returned to Berlin several times in the following years. 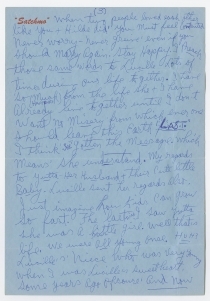 Ten years after their first European tour, they appeared in East Berlin on March 22, 1965, playing two sets, including popular tunes like “Hello, Dolly!” “How High the Moon,” and “Mack the Knife,” less than a month before he wrote this letter He also played before a crowd of more than 80,000 in the Budapest Football Stadium on June 9, 1965, just a few weeks after writing this letter. Louis Armstrong (1901-1971) was born in New Orleans and grew up in poverty. The Karnoffskys, a family of Lithuanian Jews, took him in for several years and loaned him money to buy his first cornet, and he learned about the anti-Semitism they suffered. He sang and played on the streets for money, and later played in brass bands and on riverboats. By the age of twenty, he could read music, and he began to perform solos on the trumpet and sing in his performances. In 1922, he moved to Chicago and performed with King Oliver’s Creole Jazz Band. In 1924, he went to New York City to play with the Fletcher Henderson Orchestra, the leading African-American band of the time, but returned to Chicago in 1925, where he formed Louis Armstrong and His Hot Five jazz band. For the next three decades, Armstrong played more than three hundred performances a year. In 1947, Armstrong’s manager, Joe Glaser, dissolved Armstrong’s big band and formed a six-piece traditional jazz group called Louis Armstrong and His All Stars, which made many recordings and appeared in more than thirty films. He toured the world in the 1950s and 1960s as a goodwill ambassador, and in 1964, he recorded his biggest-selling record, “Hello, Dolly!” which displaced the Beatles at the No. 1 spot, making him the oldest performer to reach that position. He was married four times but had no children with any of his wives. He may have fathered a child in a 1950s affair with a dancer at the Cotton Club. He married his fourth wife Lucille Wilson, another dancer at the Cotton Club, in 1942, and they remained married until his death in 1971. Erich Alfred Kauffman (b. 1910) was the Jewish partner and son-in-law of German trombonist Franz Schüritz, who invented Ansatz Crème, the lip salve that Armstrong used regularly. In 1938, Kauffmann married Schüritz’s daughter Hildegard Herta Martha Schüritz (b. 1910). By the 1950s, Kauffman ran the family business in Mannheim, Germany. 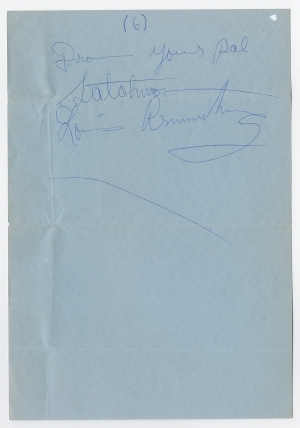 He met Armstrong on two occasions, in 1952 and 1955, but they corresponded up until Armstrong’s death. Small staple hole to left corner, expected folds with light toning.